Migration is an enormously broad topic of academic enquiry engaging researchers from many different social science disciplines. A wide variety of contributors from across the globe capture some of the methodological and conceptual range of migration research in the discipline of Geography today. 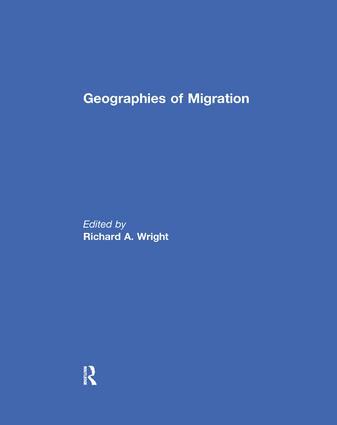 This volume covers a large area geographically and in the expanse of subject areas involved: eighteen chapters investigate migration from, to, or within at least fifteen countries, with several sections spanning multiple places and scales. Many chapters are deeply concerned with vulnerable populations, which is not only a characteristic of much immigration scholarship but also one that connects with other areas of geography. The study of geographical assertions of sovereign power via the discourses of disorder, chaos, and crisis, shows that in these transnational times, national power is being violently reasserted, on, within, and beyond international borders. Other important topics covered include migration and climate change, "illegality", security, government policy, labor, family, and sexual orientation. This book was previously published as a special issue of Annals of the Association of American Geographers.